One of the things which impressed me about our son, even before he could communicate in signs, gestures, or words, was the healthy quality of his emotional life. Yes, he screamed when he was upset, and I would have preferred a "Mom, I don't want to do that." But the things he enjoyed were reasonable, healthy things to enjoy: food that tasted good, music he liked, running around on the grass on a spring day. There was nothing weird about what he liked. His dislikes were harder to understand, but made sense once I realized that his sensory input was different than mine, and his responses were stronger. He felt hot when I barely felt warm. Tags in clothes (that I find only mildly irritating) bothered him a lot. He liked some colors more than others. Certain textures and flavors in food bothered him more. He liked some people and didn't warm up to others. These are perfectly normal responses in a small child--just on a different scale. Moon was inspired by her son, as well as the conversations she had with other parents of autistic children and with autistic people she met online to write The Speed of Dark , a near-future novel in which the story is told from the perspective of a high functioning autistic man. It would have been impossible [to write The Speed of Dark] *without* the years of experience in watching an autistic child's abilities develop. No research can compare with that. It was a difficult book to write once I committed to doing nearly all of it from "inside" Lou, but that was a technical difficulty, as any writer will recognize. It's hard to hold the focus that strongly on a single character for that long. What it boils down to is that parenting a child with autism is a difficult job; writing about it is far easier. There’s a great immediacy to Lou’s point of view, and it’s all entirely comprehensible, if deeply weird. Moon chose to include a few brief sections from the points of view of Lou’s friend Tom and boss Pete Aldrin, which probably do make the plot flow more smoothly but which always jerk me out of the complete immersion in Lou’s perceptions. It’s amazing how much of a life he manages to lead, despite how acutely he feels textures and how much he needs a regulating routine. Besides that, Lou sees patterns in the world, patterns that other people don’t see, patterns that are really there and help him cope. Sometimes this is just weird, like when he wants to park on a prime number spot, or counts floor tiles, and sometimes it saves his life. Lou's bosses recommend that he undergo an experimental procedure that will alter his brain and cure his autism, and he must decide whether to undergo the treatment. I haven't read The Speed of Dark but I have read The Curious Incident of the Dog in the Night-Time , which also has an autistic narrator. I'm interested in seeing how the novels compare in their portrayal of the autistic perspective, and I've put Moon's book on my "check out from the library' list. 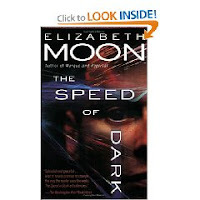 The Speed of Dark won the 2003 Nebula award for best novel. Thanks for the pointer to the essay, and the info about 'Curious Incident' - I didn't know that about the book's protagonist. I adored "Speed of Dark." If you're into them, the audio book is one of the best I've ever heard. I just discovered your blog, and clearly I'll have to come back and read more --- I am a science-fiction fan with a degree in biochemistry, so Biology In Science Fiction is a topic that sparks my interest (and, sadly, often my frustration!). I am also autistic, and have reviewed The Speed of Dark on my own blog.